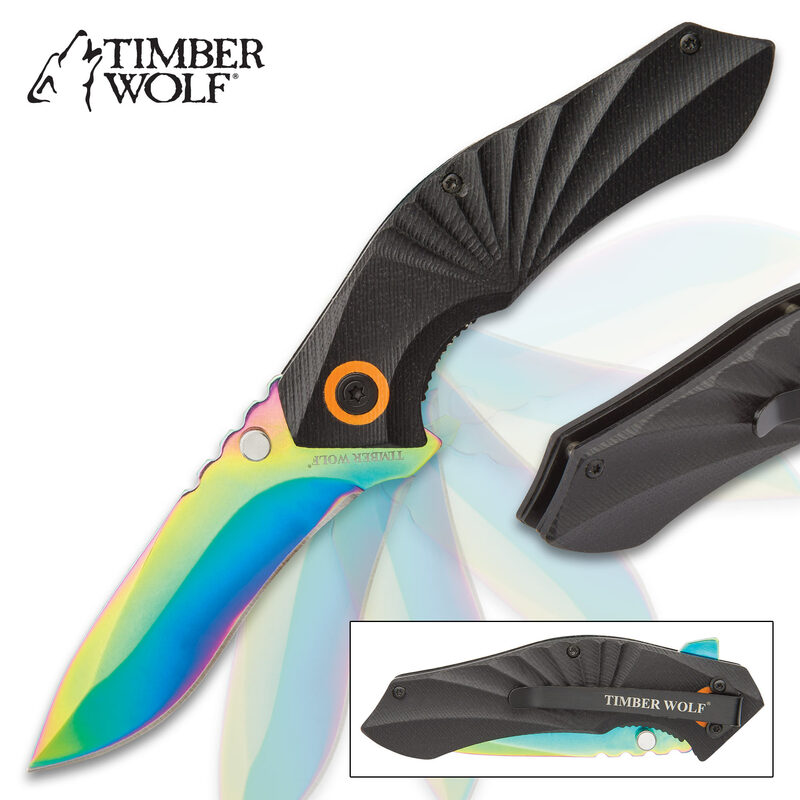 Timber Wolf Machina Assisted Opening Pocket Knife - Rainbow Blade / Black G10 Handle | BUDK.com - Knives & Swords At The Lowest Prices! 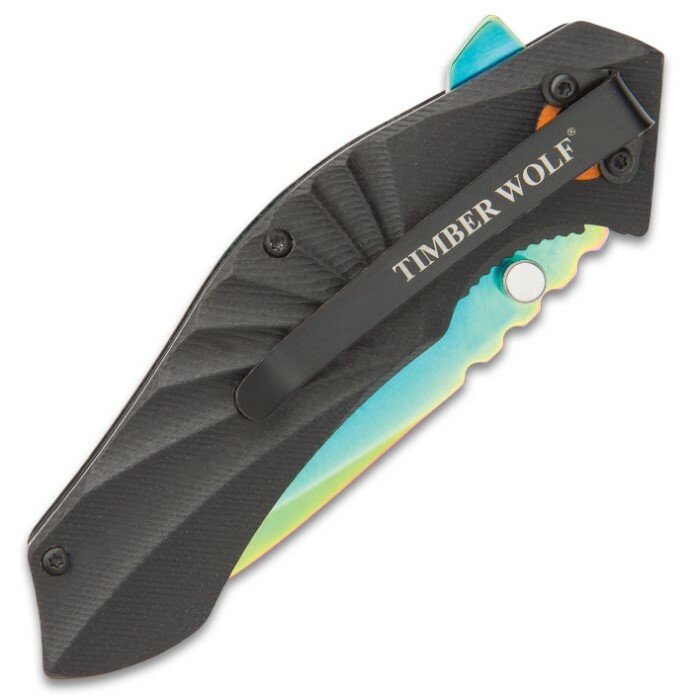 Timber Wolf has long been celebrated for its traditionally styled bowies and folders, but the contemporary-chic Machina Pocket Knife is anything but. With the Machina, Timber Wolf boldly ventures into the world of ultramodern design and state of the art technology and materials, and the results are spectacular - proving, yet again, the versatile brand's willingness to experiment and knack for innovation. The Machina's cutting edge black G10 handle scales boast a sleek angular relief design that oozes cool industrial-mod vibe. 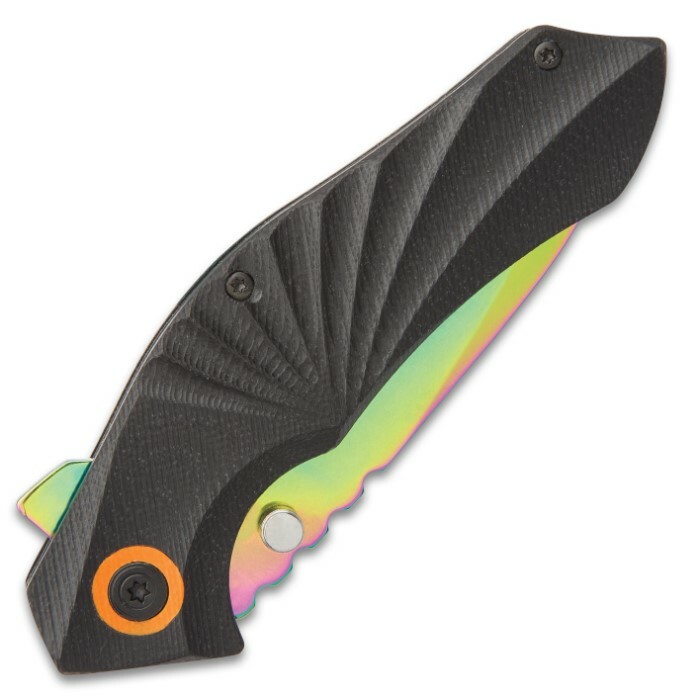 Uniquely beveled for a stylish geometric profile, the brilliant polychromatic rainbow blade complements the handle beautifully. But make no mistake - the Machina is far more than just snazzy good looks. The potent folder packs ample muscle to back up its smart facade, and it's ideal for a wide range of tasks. The 3 1/8" drop point blade is forged from durable, remarkably corrosion resistant 3Cr13 stainless steel and boasts an edge that's razor sharp right out of the box and stays razor sharp through countless rigorous cutting jobs. It deploys in the blink of an eye and stays safely fixed in the open position, thanks to the Machina's advanced assisted opening mechanism and sturdy liner lock. Just nudge the handy flipper or ambidextrous thumb studs and watch the blade swing open in mere milliseconds! Scalloped thumb grooves on the blade spine allow for extraordinary comfort and control, as do the cutting edge, lightweight yet rock solid G10 handle scales. Delicately grooved for a no slip grip, the G10 handle scales also provide a delightfully tactile wielding experience that's second to none - perfect for extended chores that require extra precision and a strong hold. At 4 1/2" closed, the Machina is easy to carry, especially with its integrated pocket clip. Regardless of how or where you take it or what you use it for, rest assured Timber Wolf's outstanding Machina Assisted Opening Pocket Knife will be poised and ready for duty, for a lifetime and beyond! I absolutely love the feel of this knife in my hand. The G10 handle is straight up excellent. I like the grip better than any other knife in my EDC rotation. However, the blade lockup when I received the knife was very unstable. I could open and close it without disengaging the liner lock more than half the time. After a while of doing this, it's gotten better. It's still not quite there, but it's easy to hear the click when it does lock. It's not a safety issue if I pay attention. It may be due to some burrs on the lock or the blade where it engages. I haven't taken the knife apart to find out. 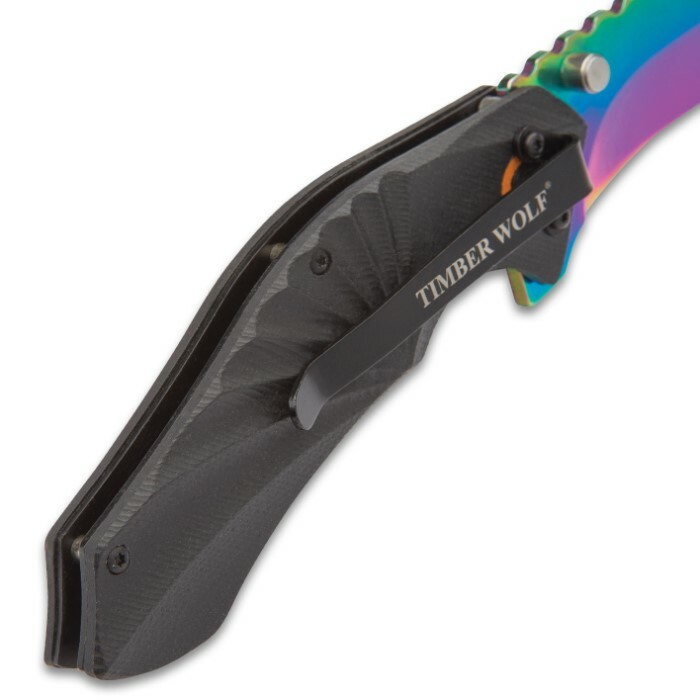 The Timber Wolf Rainbow Assisted knife is a bargain priced,good looking,easy assisted opening knife. Once you get this knife in hand, you realize how nice it is. The handle shape and ridges are nice, feels good in hand. The rainbow blade contrasts well with handle ... it's a nice look.